The Minister of Energy, Hon. 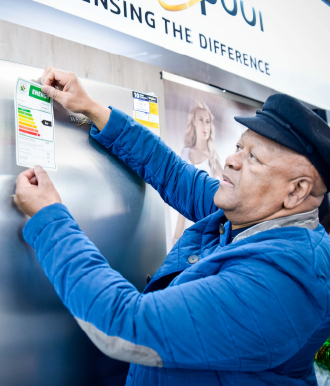 Jeff Radebe conducted a Walkabout at the Hirsch’s Homestore in Fourways to officially introduce the programme to the market as well as launch the Appliance Energy Calculator mobile application (App). The application has been designed to assist consumers to estimate the running costs of various appliances before making a purchase. The Standards and Labelling (S&L) programme implemented by the department places energy labels on appliances that provide consumers with accurate and comparable information on their energy efficiency. The project forms part of an integral part of the measures geared towards reducing electricity consumption and the carbon footprint of the residential sector in South Africa. Following the successful launch of the saving energy website, the Appliance Energy Calculator mobile App is the next innovation, and allows consumers to make in-store comparisons of different models. The app allows for consumers to enter the relevant information, easily sourced from the mandatory energy label on the appliance, into the app, which calculates the estimated running cost of the appliances of their choice. Over a 1 and 10 year period – showing which appliance uses the least electricity. Using Eskom’s published grid emission factor of 1.07 tCO2/MWh, the app also estimates CO2 emissions of the appliance. The minister encourages retail sales staff and consumers to download and use the Appliance Energy Calculator when making an appliance purchase. This easy-to-use app gives power to both to make informed decisions related to energy efficiency when purchasing appliances. The user need only input the appliance purchase price, the estimated annual consumption in kWh found on the energy efficiency label of the selected appliance and the app will then calculate the total and produce the estimated running cost of the appliance. The Appliance Energy Calculator app is currently available on Google Play for Android and Apple App Store.